This is a vocabulary program that begins in 4th grade and continues through high school. 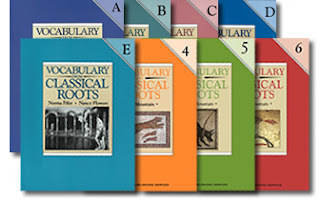 I love these vocab books because they teach your kids to look for the root words in latin and greek. This is very helpful for SAT and ACT preparation. Once you learn the roots, other words are easily recognized. I have learned along with my kids. Over 60% of our English words are derived from latin and greek words. Find free resources and samples of each of the book levels at EPS, click on Free Resources on the right side of the page for samples. You can start any year.